Heme/Onc | Black Man, M.D. Posted on August 19 by Black Man, M.D. With my time in the NICU having now come to an end, I am now one less block away from finally receiving my M.D. in May! My next rotation will be on the Hematology/Oncology service, where I’ll be completing my first Acting Internship (AI). For those of you not familiar with the concept of an AI, it’s a rotation where you literally act like you’re an intern (first-year resident) on the service. You have additional responsibilites that aren’t typically expected of medical students and it’s supposed to be one of your tougher rotations as a fourth-year student because of the fact that there is more expected out of you. At my institution, we’re required to do two of these AIs as well as an ICU month. After selecting those required rotations, you are free to fill the rest of your schedule with any electives you want. In addition, we can’t select two AIs in the same specialty here…so my other AI in January is currently in Anesthesiology. I also unexpectedly got hit with another AI rotation for my away rotation in Philly, bringing me to a total of three AIs for the year. I had initially selected an elective for that away rotation, but there weren’t any other spots left in the preferences I selected…so I’m just gonna have to go and perform my best in my AI up there! But yeah, back to the Heme/Onc service I’m starting tomorrow. I’m actually really excited about starting this rotation, because I had heard such great things about the learning opportunities present as well as about the faculty on this service. To be honest, I actually don’t think I’ve heard one person say that they had an unpleasant experience on this rotation. This is one of the sub-specialties that I’ve developed a bit of an interest in, so I’m looking forward to seeing what it’s all about. However, I am also very aware of how emotionally draining this experience could potentially be. There will likely be many ups and downs throughout this month, so it’ll be important to remain emotionally healthy as I do my best to provide adequate care to these patients. In addition to participating in the birth of twins, I also got the chance to place an umbilical vein catheter (UVC) into an infant! This catheter literally goes into the umbilical vein of the baby in order to allow for access to the central venous system so that we can administer IV fluids, nutrition, antibiotics, etc. It was a pretty simple task, but because the fellow and I had to get all gowned up and sterile, it felt like a huge deal lol. I ended up placing it EXACTLY where it needed to be and got some praise from both the fellow and attending on service 😄. And lastly, I gave an informative presentation on Epidermolysis Bullosa to my team, which was well-received. If you aren’t aware of this rare condition, just know that it’s a terrible disease to live with. I added a download link to my PowerPoint if you care to learn more about it! You could also just Google it too. Or just keep reading the rest of my post. Man I can’t believe we’re already coming up on the end of August…I don’t want summer to end!! Once my birthday comes up on the 29th, summer is pretty much over and the weather will begin to cool off again. Well actually, with this North Carolina weather, that definitely isn’t a given. It may stay hot until we get slapped in the face with a random 40 degree wind chill in October. I’ll make sure to enjoy the rest of the summer as much as I can though. Also with the end of August comes the submission of my residency application and the nearing of my first away rotation in D.C.
I’m done for now. Make sure to have a blessed week! And just as a heads up, the SNMA is partnering with the American Medical Student Association (AMSA) in getting people to pledge to vote in the midterm elections! Visit the #MedOutTheVote website to learn more about this movement! Posted on August 7, 2016 by Black Man, M.D. They not playing around this year fam. From day one, we’ve been bombarded with information about hematology, also known as the study of blood. Ever since our two-hour orientation last Monday morning, we’ve learned where and how blood is made, the different types of cells that make up our blood, the dire importance of hemoglobin (an oxygen-carrying protein) in our red blood cells, how platelets (cell fragments that help cause blood clotting) are created and what disorders can manifest with them, some of the important anti-emetics (anti-vomiting/nausea drugs) in use today, various hematologic disorders, the importance of blood banking, etc, etc, etc. As you can see, it has been an intense first week back. However, my excitement to be back hasn’t faded yet lol. I’ve been having a good time learning about all of this, because it’s so vital for my future profession. I’m going to definitely need to know how to read a CBC (complete blood count) and how to think through a differential and diagnose various conditions simply from reading blood charts. As a matter of fact, we got the chance to have our own blood drawn (it wasn’t as bad as you might think…for me at least) in order to not only receive our own blood chart, but to also look at our own blood sample under a microscope! It was pretty damn cool, if I do say so myself. Taking these pictures through a microscope took forever though. Smh. Also, our main professor of our Hematology/Oncology block created a house contest that we’re participating in throughout the block called the “Blood Cup”, where each of our respective houses accumulate points for participating in class, donating blood to blood banks, getting questions right on our formative quizzes, signing up to be a bone marrow donor, etc. The house with the most points at the end of the block will win “a spectacular prize” at the Awards Ceremony at the end of the block. So that has added some flair to this block as well. In addition, I think that it’s worthwhile to note that last Friday was the first time that I had a black male professor lecture to me since I’ve been in medical school. (He was also Nigerian. ✊) I won’t lie, I was both pleasantly surprised he was going to lecture to us and intrigued with what he had to say. His lecture was about blood banks and blood typing, more practical and useful information for me. Although it was just another typical lecture with nothing too exciting happening in it, I found myself sitting up and listening attentively for the majority of the 90-minute lecture without really trying. The subconscious mind is a powerful force indeed. After he was finished, I couldn’t help but walk up to him and thank him for giving the lecture as well as tell him that he was the first black male that has given my class a lecture. He was pretty surprised and I guess he was expecting me to ask a blood bank related question, but he appreciated it nonetheless. Representation really does matter y’all. I’ve also been granted a “little”, which is a first-year student whom I’ve been entrusted with the responsibility of facilitating his adjustment to medical school and with facilitating his time here in general. I just met him earlier at lunch for the first time, and I’m happy to say that we got along quite well. He’s pretty interesting in general, considering that he used to do stand-up comedy for fun, toured the East Coast in a band during college and co-owned/worked a grilled cheese food truck during college as well. He’s a cool guy overall and funny too; I’m looking forward to getting to know him more. Oh and I’m excited about the Olympics starting, although I won’t be able to see the majority of it due to, well, you know, school. I’m definitely gonna catch track & field though, can’t miss that event! 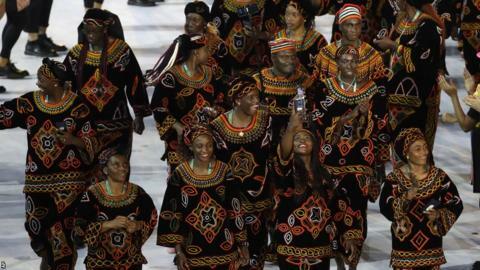 And shoutout to Cameroon for coming out in fresh style during the Opening Ceremonies!! One last thing, I was invited to attend a city forum that engaged the local community with the local police in Winston as well as with a lawyer that practices law around here. We received a very useful pamphlet from the National Black Police Association that informed us of what to do when stopped by police officers whether it be on the street, in our car or even when they come to the front door of our house. It also emphasized the DO’s and DON’T’s during an engagement with officers and what to do when arrested or taken to a police station. I’m definitely keeping this little pamphlet with me at all times. In regards to the actual discussion, the lawyer informed us about our many rights as citizens, some of which I had no idea about. He talked about our right to deny an unjustifiable search of our personal property, which is actually stated in the 4th amendment and about the 5th amendment in general. He also informed us about the existence of civilian review boards, which are entities filled by citizens of a city who have the task of reviewing complaints regarding police misconduct and making recommendations as to how the accused officers should be disciplined. In addition, he told us how it was possible for us to ask for an officer supervisor if we felt that we have been unjustly pulled over, to which the police in attendance agreed. Granted, it would make the stop that much longer but if you truly feel that it was unjust, that’s an option for you. After the lawyers spoke, the police officers spoke with us on how to formally file complaints about police misconduct, the importance of compliance and getting home safely in the event of an encounter with law enforcement, and how it’s within our rights to ask the officer as to what means of probable cause or reasonable suspicion made him/her pull us over. They also told us that in the event of an unjust encounter, we should make a mental note of the names, badge numbers and any other relevant information of the officers involved and write them down along with the details of the encounter as soon as we’re free to go. Then we could either go to a police station or City Hall in order to file a formal complaint. They repeatedly stressed how most officers are good people and that they just want to have a good day at work and go home to their families, much like any other citizen that they’re working to serve. They also said that they recognized that there are a handful of unjust officers out there and that they’re very willing to work with us to identify them and relieve them of their duties as a law enforcer. All in all, there was a lot of helpful information presented and I’m glad I took some time to check it out. It’s crazy how many people don’t truly understand their rights as citizens. With that said, I believe that in order to help change a system, we must make a concentrated effort to understand what we don’t know in regards to that same system. Make sure to have an awesome week! And always remember, your circumstances don’t define who you are…your choices do!